Café Fijnhout is a small bar in the city area Oud West. It’s a ten minutes walk from the Leidseplein and the Elandsgracht. Cafe Fijnhout used to be a French orientated restaurant. 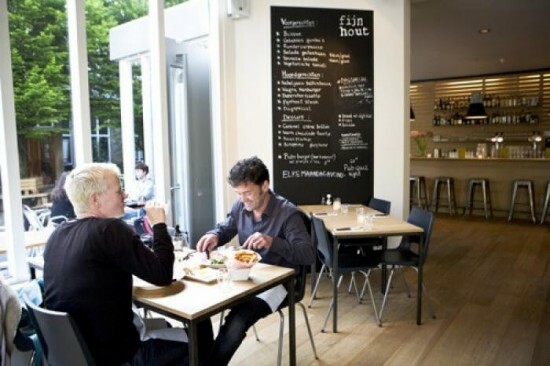 The owner wanted a broader kitchen and different people in his café so he shut the place down for almost a year and Fijnhout was born. I have to say he did a good job. The interior looks fresh but warm at the same time. This one is a winner in the summer. You can sit on a floating terrace on the canal. You almost can touch all the boats coming by and watch all the people on the boats getting more and more drunk. The lunch and dinner menu is not too big but also not too small with good courses. Also a plus is the prices are reasonable. If you did a big walk through the Vondelpark for a while, make sure you stop at this place.